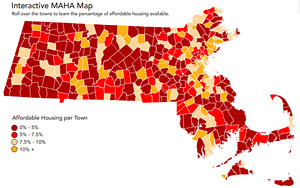 Every city and town in MA is required by state law to have 10% of their housing stock as affordable. Where does your town stand when it comes to offering affordable housing? Which Massachusetts towns rank highest in their percentage of affordable homes? Which cities or towns are lacking? Roll over the towns you will learn the percentage of affordable housing available. Below the map are PDF files for download. We’ve obtained data on all 351 cities and towns in the state and compiled them here for you to search. Maybe the info will help you decide which town lotteries to explore. Maybe they’ll get you to write your local representative to find out why your town’s rank isn’t higher. Maybe they’ll just give you one more reason to feel good about where you live.